Hire of food room for 2 hours, hire of the activity room for 1 hour, a party leader for 2 hours, invitations for up to 25 children and a one month membership for the birthday child. Simply select your chosen party type at the time that suits you best, complete our booking form, pay and collect your invitations. Exclusive use of both our pools with the big floats, balls and games, splashing and fun. Exclusive use of both our pools along with our 14 metre long floating obstacle course,‘Determinator’. Football crazy? Then this is the perfect party for you. This football mad party includes matches, penalty shootouts and skills competitions. Go football crazy, bouncing mad and score the winning goal at your party with matches, penalty shootouts and skills competitions. 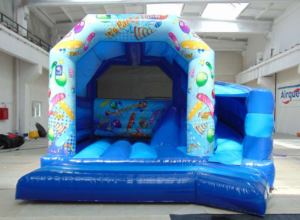 Includes two big bouncy castles, balls, Didi Cars, tunnels, skipping ropes, skittles, a matted soft play area and much more!! The ultimate bouncing birthday party! Learn the basics or build on your current skills on our massive trampoline or go bouncing crazy on the bouncy castle. Payment is required in full to secure a party. Any bookings taken are given 72 hours to pay, otherwise the booking is lost. A non-refundable deposit of £15 is taken for all booked parties. Any party cancelled with less than 2 weeks notice will only receive a 50% refund.